„Let´s start with the most important thing“, says Mauro. „If the engine cuts out, please don´t panic. This aircraft can be landed like a glider.“ What an intro! Actually, Mauro Pacchioli has to smile himself after making it. He knows only too well that we are in Switzerland, where the precision of airplane maintenance is taken even more seriously than that of clockwork. Moreover, the 44-year-old Italian is an experienced pilot. He has started his little white Piper Warrior, which is waiting for us at the sports and military airport Locarno, well over 500 times. Mauro Pacchioli is a man of many talents and passions. He breeds plants and parrots and is training to become a classical singer at the Helvetic Music Institue Blinzona, where he is taught by a tenor from the Scala Milan. At his Giardino restaurant, Aphrodite, the maître d‘ occasionally breaks into an aria at dinner time. His hotel guests only know him in formal suit. Now he is wearing a bomber jacket, Ray Bans and baseball cap. He climbs into the aircraft and starts the engine. Last security check. Mauro glances at the instruments, presses a few buttons, makes contact with the tower – then we´re rolling towards the runway. On the right hand side, a gas station, a bit further on a massive military helicopter. We come to a halt. The pilot test revs the engine in neutral: „Works beautifully“. Were the engine a singer, it would be a baritone. „You have to fly a vecchia signora (an elderly lady) like this with style and sensitivity“. Flight control gives its ok. Mauro moves the gas lever forwards. The plane starts rolling, gathering more and more speed. The lights on the left and right of the runway become solid lines. Take off! Incredible! Heading south from Locarno over the green Brissago islands. 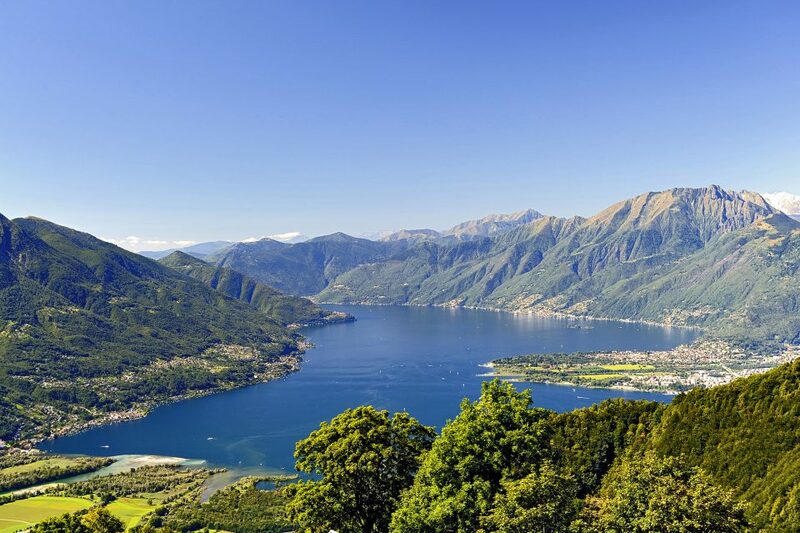 Then we´re flying over Ascona at 120 miles an hour. It´s easy to make out the boats in the harbour and the promenade. Even the free spirits on Monte Veritá would still be visible, were they still looking for their happiness, dancing around in dresses of light. Mauro immediately asked to have Saturdays off at the Giardino. Three years later he held his pilot´s licence in hands. His final test was a solo flight to Sion in Switzerland. His longest flight so far took him to Genua. We´re also just flying over the border to Italy – at roughly 120 miles an hour. Visibility is perfect, we can make out the Alps on the horizon. Grandly we float high above the countryside. Verbania comes in sight, pretty historical buildings. In one of them lives Eros Buratti, the world famous cheese merchant. To the right the botanical gardens of Villa Taranto emerge, where the first camellias are blossoming already. Konrad Adenauer once donated a fir tree to the estate. „Do you want to take over?“, Mauro asks. „Well, rather not, or perhaps…what do I have to do?“ I follow Mauro´s instructions, get hold of the steering in front of me and keep it steady. 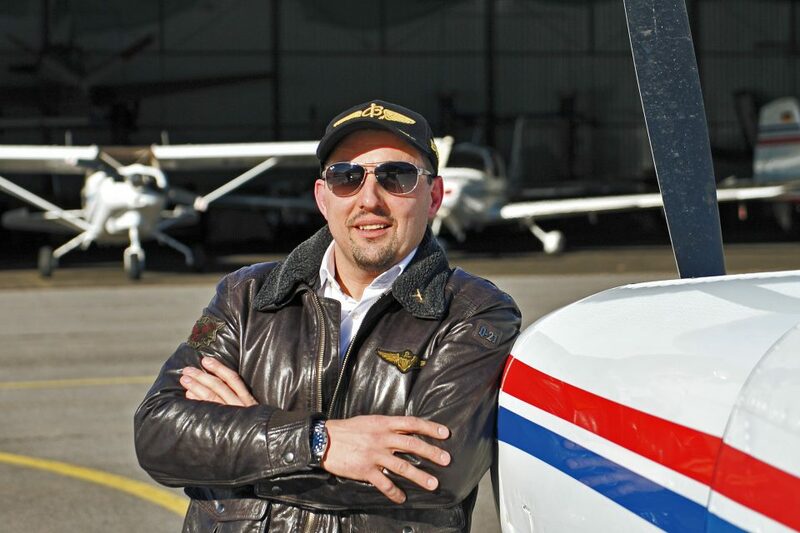 „As a pilot you need courage, discipline, concentration and respect for man and machine. Such a Vecchia Signora / an elderly lady needs to be treated with style and sensitivity.“ says Mauro. I push the steering column forward, the elderly lady drops down, we are now heading directly towards the Borromaic islands. To be more precise, towards the biggest of the islands, Isola Bella. Another elderly lady. Her summer palace and terraced park greet us from below. Napoleon stayed here. Carefully I pull the joystick towards me and we gain altitude again. Who’d want to drive a car after this adventure? Somewhere above Centovalli – I have in the meantime handed the job back to the pilot again – Mauro makes contact with the tower and announces our return. Whoever called this patch of land Centovalli, must have been drunk. It´s only a single valley but it looks magnificent. Ragged cliffs, dense jungle, waterways, mountain ranges. And the Maggiatal, incredibly green as well. Somewhere down there lives Dimitri, the famous clown. Is he juggling balls right now? Or having his lunch time nap? „Look“, says Mauro and points towards a gigantic wall. 660 feet high. That is the dam wall James Bond jumped off in Goldeneye. These days bungee jumpers throw themselves off it. „Have you tried that too, Mauro?“, I ask. „No“, says the pilot, prepares for landing and, after an hour of flight time, brings the Piper Warrior safely to the ground. Then he mounts his Kawasaki and disappears. By the way, he´s got the same motorbike as Tom Cruise in Top Gun.